London has 5 main airports and Luton Airport is the least known but possibly easiest to use. 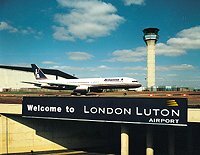 There are no long-haul flights from Luton Airport, but plenty of domestic and European flights use Luton. It's also known as London Luton. Located 32 miles from Central London, and 90 miles from Birmingham, Luton is easy to reach from most of Southeast England and the English Midlands. The airport catered to just under 10 million passengers in 2007, with most of that traffic international. It's a single runway airport, but the footfall is less than a quarter of Heathrow's, and is still operating below full capacity. 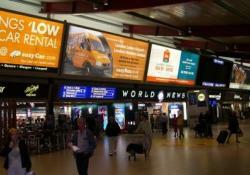 For smart travelers, Luton has become a refuge from Heathrow hassles. The airport has seen a 400% increase in passengers in the past 10 years, and the number is climbing. This increase is in large part because arriving at or taking a flight from Luton Airport is much simpler and quicker than Heathrow or Gatwick. As passenger demands are increasing for London as a whole and Heathrow in particular, the benefits of using an alternative airport are growing stronger. Heathrow is limited in the expansion that can be undertaken, and a third runway is a long way off, allowing air congestion to continue. Luton Airport can still expand as it's outside of the residential areas of Luton and with further capacity to increase passenger numbers, it'll remain a more pleasant experience for some time. Add that it's more convenient for any North London destination, or resident, and Luton comes highly recommended. If you are going to London, and your hotel are in the north part of the city or center, try to see if there's a flight to Luton Airport instead of Heathrow or Gatwick airports. It may be faster, cheaper, and less stressful to fly there. One of my favorite things about Luton Airport is the 24 hour Marks & Spencer store in between the arrivals and departures areas. While the airport has a food court, it keeps somewhat limited hours. However, thanks to M&S you can get a meal at any time. Car: There are driving directions on the Luton Airport website. 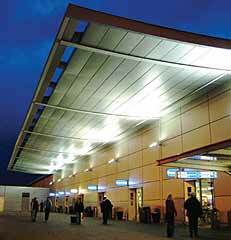 For Luton Airport parking, your best option is to pre-book your space at one of the commercial lots. Rail: There is a nearby rail station with a bus shuttle service at Luton Airport Parkway. Trains arrive here from London's Kings Cross St. Pancras, Milton Keynes, and various connections. A ride takes about 25 minutes from Kings Cross station. To book a ticket, either buy a ticket at the station or book one at National Rail. Bus: 3 companies run buses to Luton Airport - Green Line, National Express, and easyBus. A ride from Central London takes about 1.5 hours and costs from £12 to £17 for a return ticket. There are also local buses connecting in the Luton area. Taxi: A taxi ride in a black cab from Central London to Luton Airport will cost around £80 each way. A mini cab will be circa £65 each way. Last updated by jack on 29 October, 2011 in Destinations.